For years I have had my office rally around the cause of adopting turkeys and the adoption certificates are now hanging up all over the place. It leads to a lot of interesting discussion. Most of the time people crack a joke about how the turkeys deserve to be eaten or something but, as time has gone on, I’ve learned to always say “well these turkeys were abused” and it changes the conversation. When people first hear about food animals being saved they picture a healthy robust animal on it’s way to get processed for the super market getting stolen off the assembly line by some rouge vegans who want to rob people of their holiday bird. I think this is the story folks really want to believe. They choose the Utopian farmer story so they don’t have to think about factory farms and monstrous slaughterhouses. When you tell them the reality of these turkey’s lives, well people don’t joke about it again after that. Maybe these turkeys were abused or fell off the truck. Maybe it was too sick to be taken into the slaughterhouse so it was abandoned in a dumpster outside to die slowly. I usually mention how all turkeys are confined to tiny spaces and their beaks are cut off. It really makes people think and sometimes they throw in a couple dollars to our adopt a turkey fund or at least they think it’s a pretty great thing to do. It can be tough to have these conversations though. It took me a long time to be able to realize that arguing the “meat is murder” point will never get you anywhere but nobody wants to see animals tortured and abused. It’s a much easier starting point. I do love telling people, after that, about how Farm Sanctuary has a Thanksgiving party *for* the turkeys. Once people feel bad for a turkey’s tough life they love hearing about little kids feeding turkeys sweet potatoes and apples to celebrate the holiday. It’s a great program. 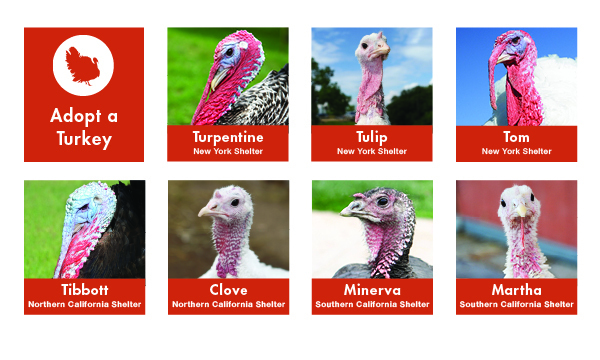 I encourage you to adopt a turkey too, and to tell all of your friends about it. It’s a great way to honor the holiday in my experience. If you live in Austin Capital City bakery is going to be having our own little party for the turkeys. Kristen is cooking up tons of stuff, both sweet and savory and she is going to be sampling all of her Thanksgiving pies. 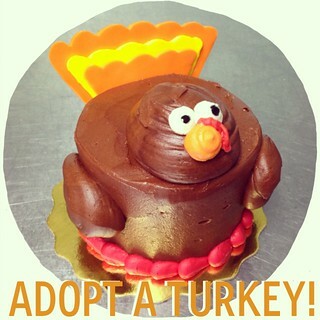 10% of all sales are going to Farm Sanctuary and if you pledge TODAY to sponsor a turkey you will get a totally free 4″ turkey cake. You have to order today though at orders@capitalcitybakery.com or 512.666.7437. You also have to get your orders in today for Thanksgiving pies from Capital City Bakery and also Thanksgiving Dinners from Happy Vegan Bakery or Counter Culture. 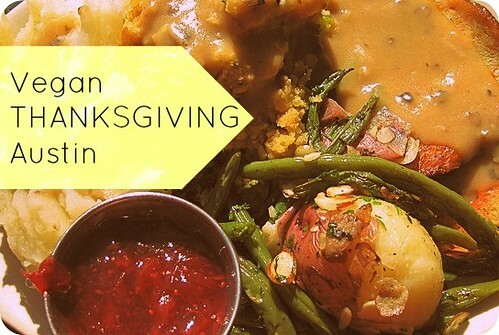 Check out the Thanksgiving roundup for more info. This entry was posted in animals, Austin, Events and tagged adopt a turkey, Austin, Capital City Bakery, farm sanctuary, tukeys, vegan on November 22, 2013 by lazysmurf.